Hurricane Florence is expected to cross through South Carolina after making landfall. "Life-threatening, catastrophic flash flooding and significant river flooding is likely over portions of the Carolinas late this week into early next week," the National Hurricane Center says. A hurricane warning — meaning hurricane conditions are expected within 36 hours — is in effect for a long stretch of the coast, from the South Santee River in South Carolina to Duck, N.C., which is part of the Outer Banks. 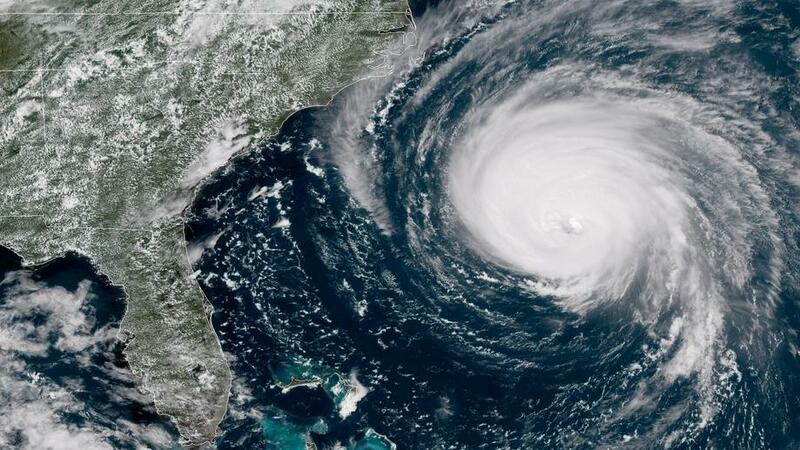 Hurricane conditions are likely to hit the area around North Carolina's southern coast on Thursday night and Friday, but tropical storm conditions will arrive on earlier Thursday, according to the hurricane center. "Disaster is at the doorstep and is coming in," North Carolina Gov. Roy Cooper said. "If you are on the coast, there is still time to get out safely." The time to prepare is almost over, he said. In addition to the dangers the expected deluge of water poses, the hurricane center cautioned, "A few tornadoes are possible in eastern North Carolina beginning late Thursday morning." South Carolina Gov. Henry McMaster said, "This hurricane is bringing more rain than any other hurricane," according to SCETV. After Florence's rain starts to fall this week, he said, the rainfall could continue through Monday. The threat has sparked a rush of evacuation efforts in South Carolina and North Carolina, with more than 1 million people urged to get out of Florence's way. Governors of those states have already declared states of emergency, as have the governors of Virginia and Maryland. Georgia Gov. Nathan Deal followed suit on Wednesday. 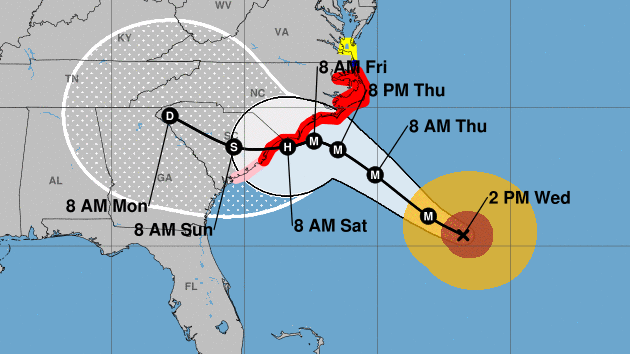 Forecasters have adjusted Hurricane Florence's projected path, saying that after it makes landfall, it is likely to take a more southerly route than expected. Rather than pushing up toward western Virginia, the storm's center is now predicted to move across eastern South Carolina on Friday night and Saturday. "These enormous waves are produced by being trapped along with very strong winds moving in the same direction [of] the storm's motion," the agency said. For a swath of the North Carolina shore from Cape Fear to Cape Lookout, the storm surge could range from 9-13 feet, the NHC said. In Myrtle Beach, S.C., and nearby areas, the surge could hit 6-9 feet. News that the storm could plow through South Carolina after landfall came shortly after McMaster lifted his mandatory-evacuation order for Beaufort County and many other areas south of Charleston. The only exception was Edisto Beach — that and other areas to the north remain under evacuation orders. On Wednesday, McMaster said that emergency lane reversals — using all lanes of I-26 out of Charleston and Highway 501 near Myrtle Beach for westbound traffic — will cease on Thursday, two days after the measure was instituted. Emergency preparations in South Carolina now include more than 2,100 of the state's National Guard soldiers. In North Carolina, Cooper says, "2,800 soldiers will be on active duty, joined by even more on standby." The Charleston International Airport will close Wednesday night at 11:59 p.m. until further notice, reports George Kearns of South Carolina Public Radio. He adds, "Businesses in Myrtle Beach are to have operations ceased and secured by 5 this afternoon." "Historical rainfall amounts from #Florence are possible with UNPRECEDENTED flooding," according to the National Weather Service office in Newport and Morehead City, on North Carolina's coast. In Charleston, the city government said that after giving out 53,000 sandbags, "there is no longer any sand available at any city of Charleston location." In Wilmington, the fire department is urging people to prepare for at least seven days of hardship, collecting water and nonperishable foods. Thinking of the outages likely to come, it also warns to use grills and generators outside — away from doors and windows. For anyone needing a place to stay to escape the hurricane, both North Carolina and South Carolina are updating their lists of emergency shelters. Florence is currently heading for ocean water that has surface temperatures of about 85 degrees, meaning it will most likely strengthen on its way to the East Coast. Even with some weakening that is predicted just before it makes landfall, the storm "is expected to remain a dangerous major hurricane as it approaches the coastline," the hurricane center said. "Rather than a very narrow and intense band of winds, the winds are slightly weaker — but [they] cover a much larger area," NHC senior hurricane specialist Stacy Stewart said on Wednesday. "So Florence is kind of spreading out, becoming a much larger, more stable hurricane." Florence is predicted to turn more toward the northwest through Thursday — but then is expected to head more west-northwest and stall a bit over the Carolinas. As the hurricane center says, "Florence is expected to slow down considerably by late Thursday into Friday, and move slowly through early Saturday." The slow movement, combined with the massive amount of moisture this storm holds, will bring dangerous rains — from 20 to 30 inches in coastal North Carolina and 40 inches possible in isolated areas, the weather service says. In South Carolina and inland parts of North Carolina, 5 to 10 inches of rain could fall, with 20 inches possible in some areas. "This rainfall would produce catastrophic flash flooding and significant river flooding," the hurricane center says. On Wednesday morning, Florence was extending hurricane-force winds outward up to 70 miles from its center, with tropical-storm-force winds up to 175 miles outward. With that much size and strength, even a glancing blow could be devastating — something forecasters stressed as they noted the shift in the predicted track. "Just because we have a landfall to your south, that doesn't mean you're out of the woods, because the winds are huge around this system," NHC Director Ken Graham said, pointing out the wide risk of flooding. To back up that point, Graham cited a sobering statistic: "50 percent of the fatalities in these tropical systems is the storm surge — and that's not just along the coast. It goes well inland." An additional 25 percent of deaths are related to rain, he said. President Trump says the Federal Emergency Management Agency and first responders are poised to help — but he also warned people to get out of the storm's path. "Bad things can happen when you're talking about a storm this size," Trump said Wednesday morning. "It's called Mother Nature. You never know. But we know."